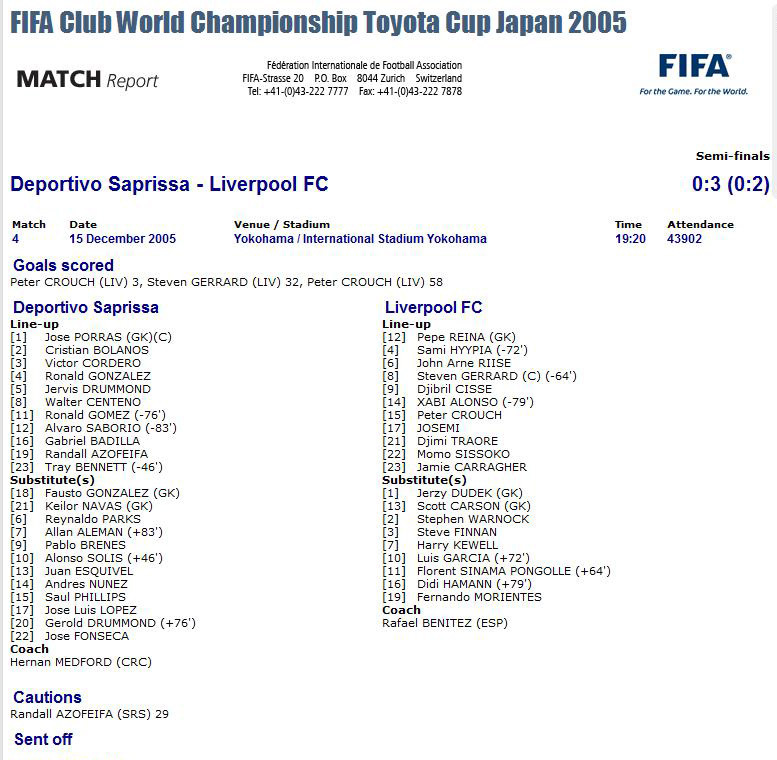 Liverpool played in the FIFA World Club Championship in 2005 after winning the Champions League Final. The Tournament is also called the Toyota Cup because it's sponsored by Toyota and played in Tokyo of Japan. The shirt used in the World Club Championship was the 5-stars Chamions League home shirt, but there are some interesting differences. 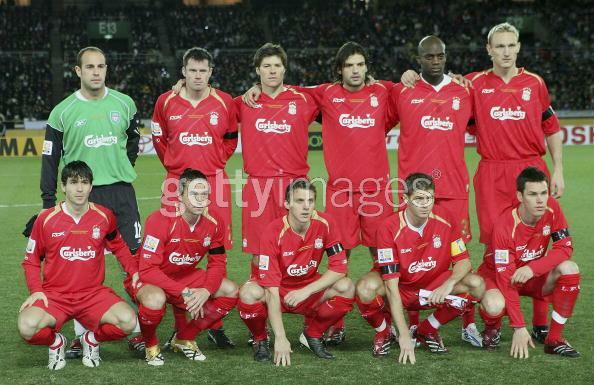 Featured Liverpool squad playing in the World Club Championship in Toyko, Japan. The tournament is also know as Toyota Cup. This is the pre-match squad photo against Deportivo Saprissa. Liverpool played two matches in the tournament. 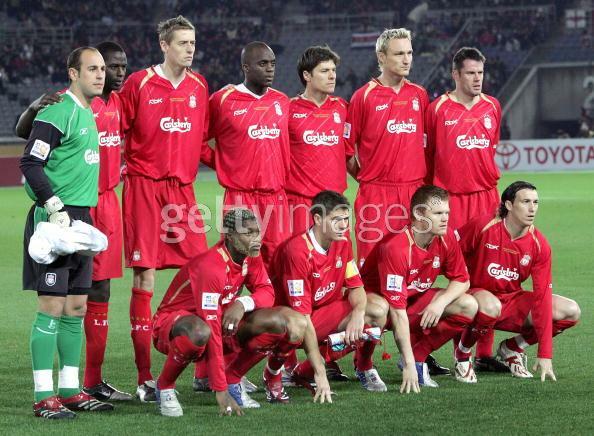 This is the pre-match squad photo against Sao Paulo. Note that in both matches, Liverpool's Champions League shirt has a special embroidery and a special patch applied. 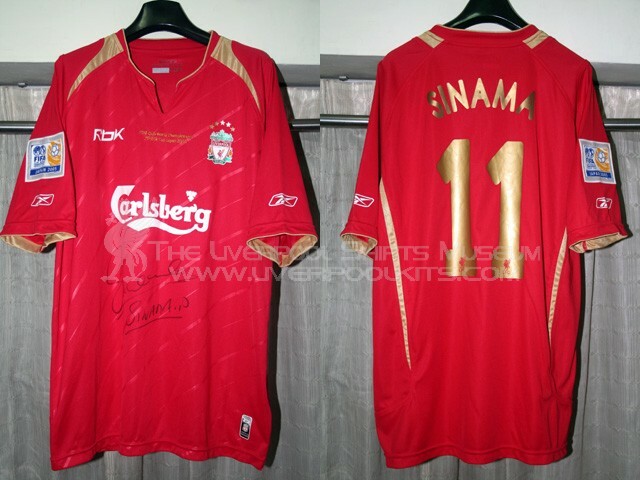 Liverpool 2005 World Club Championship Home Player Shirt - This is a match spare issued shirt of Sinama Pongolle, autographed by him in front. Now you may ask, "Hey, is your shirt wrong? 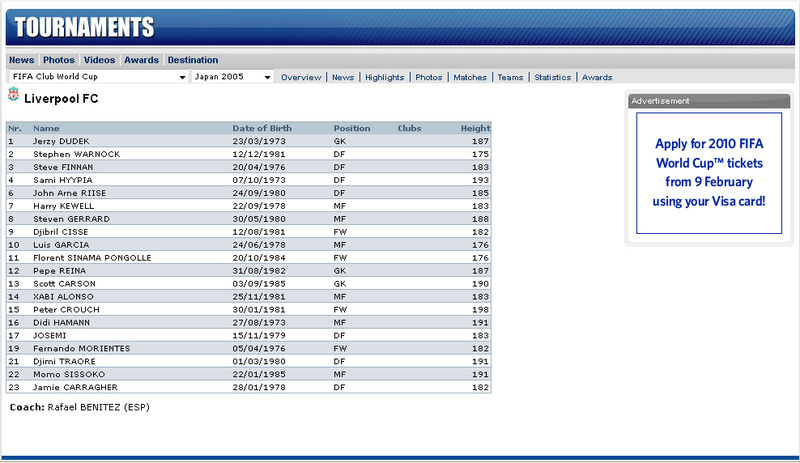 I reckon Sinama Pongolle's squad number in 2005-2006 season was 24 instead of 11." Spot the differences above lads! Left: The World Club Championship shirt has golden embroidery on the chest front, and ironed with a special patch on right sleeve. Spot on the small numbers ironed on the shorts of Sinama Pongolle - they are 11 instead of 24! Right: Standard Champions League player shirts were applied with Badge of Honour and Champions 2004-2005 patches. The shorts showed ironed numbers 24. 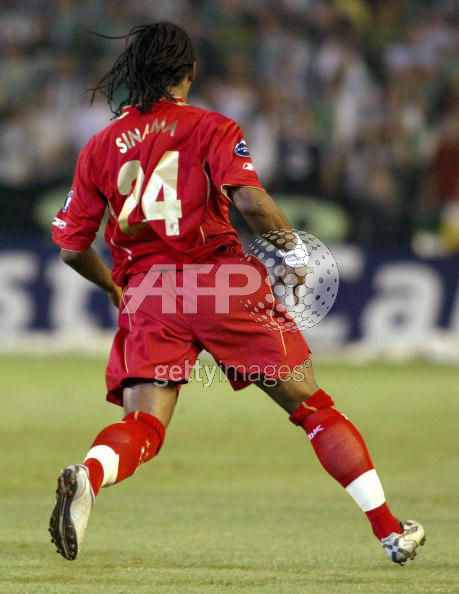 Look again, Sinama Pongolle's golden number on the backside is 24 in the Champions League. So what's the implication? It means that normal squad numbers changed in the World Club Championsship. 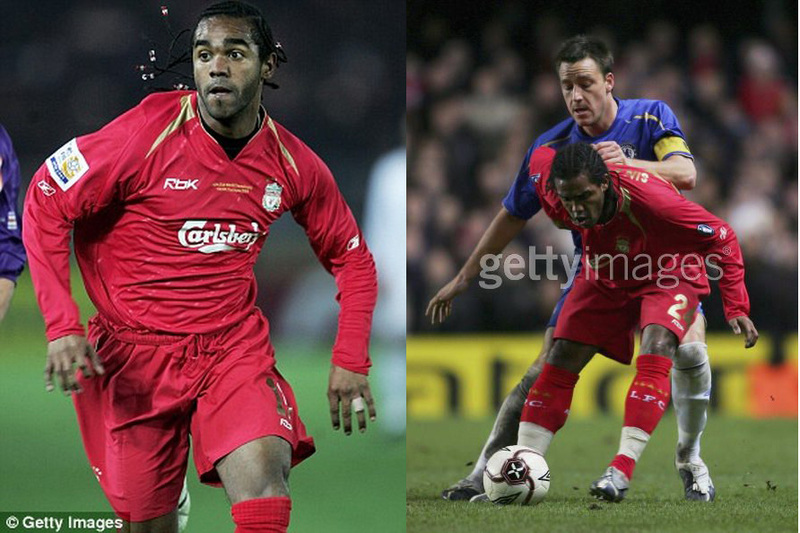 In both matches Liverpool played, Sinama Pongolle's squad number was 11. Shown in above the match report against Deportivo Saprissa. Shown in above the match report against Sao Paulo. 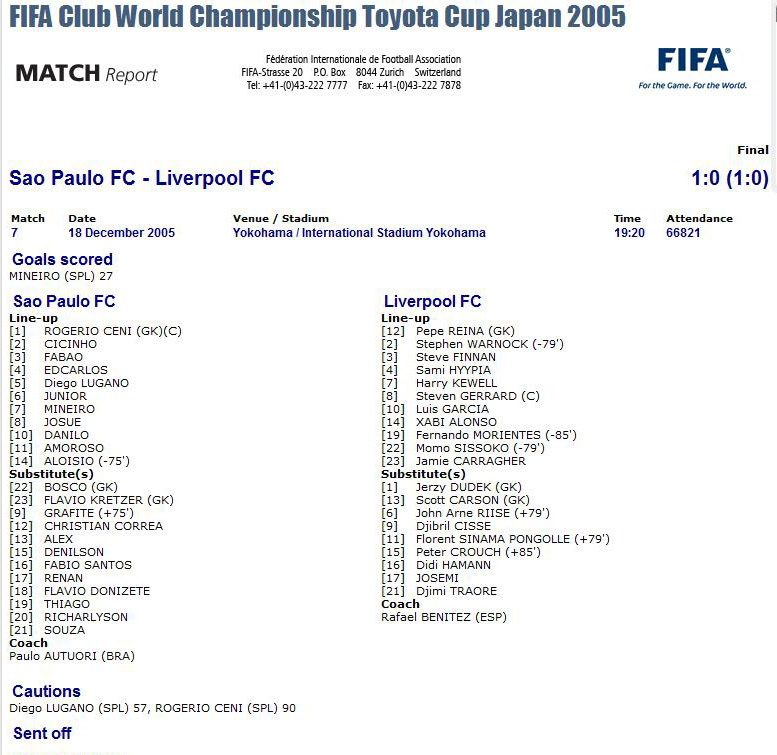 The rationale behind Sinama Pongolle's change of squad number is that, FIFA ruled that each participating team in the World Club Champions 2005 should have a squad size of 23 players, and players are assigned with shirt numbers from 1 to 23 only. Scott Carson is an exception. He has an original squad number of 20, but also changed to 13 in this tournament. As aforesaid, this is an autographed match spare shirt. 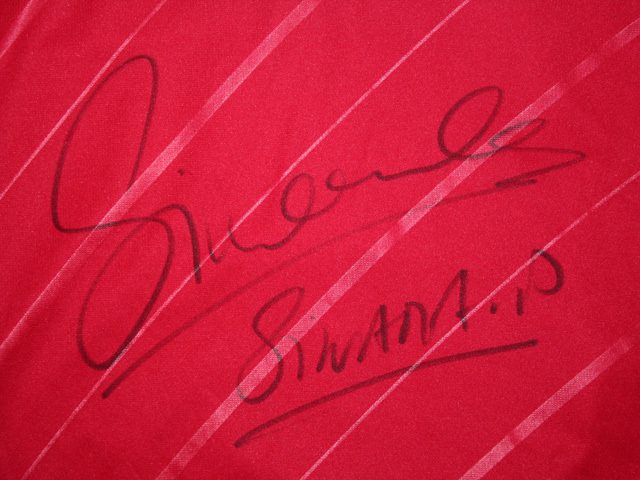 It bears the autograph of Sinama Pongolle on the chest front.